The eBOX310-830-FL compact in-vehicle box computer is for in-vehicle use. To further ensure its implementation for in-vehicle applications, the fanless eBOX310-830-FL is certified with E-Mark Certification (E-13) and ISO-7637 power standard, which certifies it compatible with other vehicle components and meets tier-1 car maker's requirement. In addition, the design of power module incorporates a MCU microprocessor for power control. The unit is powered by an Intel Core 2 Duo processor with the Intel 945GME and ICH7M chipsets. One 200-pin DIMM socket supports up to 2GB DDR2 400/533 DRAM for high memory bandwidth. 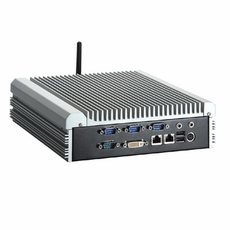 The eBOX310-830-FL with anti-vibration up to 2Grms (with HDD) and excellent thermal resistance is an all-in-one in-vehicle computer for use in any car, truck, bus or even for maritime applications.